Bell’s Hopslam to be released in cans this year. Being a huge fan of both Hopslam and Craft cans this is excellent news in my opinion! One of our most sought after beers, Hopslam Ale, will be packaged solely in six-packs of 12 oz. cans and kegs when it returns in January for its annual release. The Double India Pale Ale, brewed with Michigan honey, will not be bottled as it has been in the past. “With construction here at the brewery on top of an already very busy schedule for our existing Bottling Hall, this was the only way to ensure that this beer got to market as quickly and as fresh as possible,” said Bell’s Vice President Laura Bell. “Our Canning Line is very well equipped to lend a hand and help get this aromatic beer to our fans and customers so that they can enjoy it as it is intended,” she added. Our current expansion will almost triple our Comstock Brewery’s footprint once it is completed next year. Part of that construction is a new Bottling Hall that will be able to run at triple the speed of our current bottling line. Future packaging decisions, beyond 2016, will be decided at a later date and as construction wraps up next year. 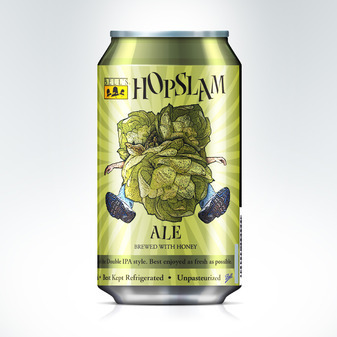 Hopslam (10% ABV) will be the sixth Bell’s beer to be packaged in cans. Two Hearted and Bell’s seasonal offerings (Oberon, Best Brown, Winter White and Smitten) are packaged in 4-packs of 16 oz. cans.